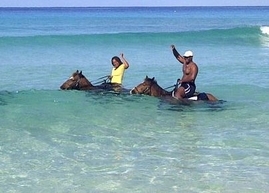 Have you ever dreamed of doing a horseback ride along the white sandy beaches of a tropical get away, or doing a ride n' swim in the shallow Caribbean waters? Well look no further! 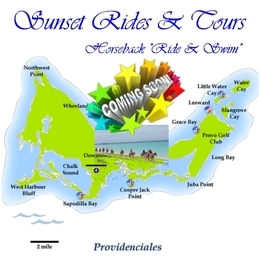 Sunset Rides & Tours, Grand Turk Turks and Caicos Islands will make all your equestrian dreams come through. 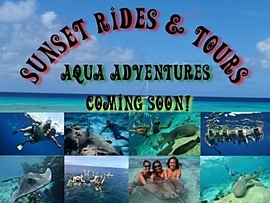 Come on over To Grand Turk, Turks and Caicos Islands and visit us. We offer guided horseback rides Monday – Saturday. On Sundays, our horses get the day off for rest and relaxation. Whether it's by boat, by plane or Cruise ship, we cater to all visitors and guests arriving at our shores. All experience levels are welcomed! Ages are from 6 years old and up (if they are younger they must be experienced riders). All children are led by our guides until we are satisfied that they can handle the horse on their own. We have a 220(ish) pound weight limit. Because we do not do "Nose to Tail" rides we prefer small groups which are never more than 10 riders, unless all rider are experienced. 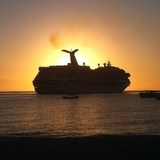 And we promise you personal and professional service and we set out to discover Grand Turk at your own pace. Reservations are required at least one week (7 working days) in advance, as well as the body weights and experience levels of all riders in your group, so that we can properly assign horses to riders based on the rider's experience and the horse's temperament. We are pleased to announce that within a few months we will be expanding our business to include horseback riding on the island of Providenciales. Some where out there in the middle of the Atlantic Ocean, where the sun always shines, and gentle summer breezes always blow, lies a peaceful group of Islands surrounded by crystal clear water, that meets a shoreline of white & golden sandy beaches. On these Islands you can find some of the world's most naturally beautiful and friendliest horses. 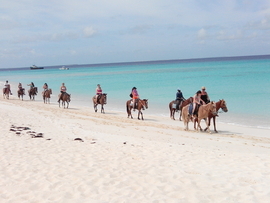 Grand Turk, Turks & Caicos Islands, where our horses are waiting to make your dreams come through!